Let me introduce you to the North Channel and Manitoulin Island, both very special places. You'll find that in addition to the wonderfully clear water, the unspoiled air, and the rugged and beautiful scenery, the island is a source of spiritual energy that refreshes and renews its summertime visitors. Despite its proximity, Manitoulin Island is not well known in the United States, even in Michigan, its closest neighbor. Perhaps one reason for this is a quirk in the design of the highway maps for the State of Michigan. For as long as I can remember, the layout of the official state highway map has located a mileage table on the upper right corner of the map page, and covered Lake Huron with tables and other information These tables land right on top of Manitoulin Island, covering 90% of it. 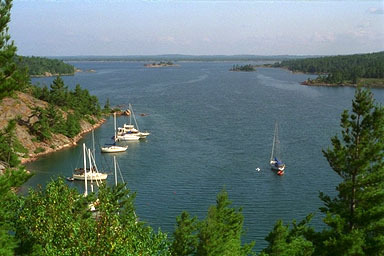 Drummond Island and Cockburn Island are usually shown, but Manitoulin is usually unnamed and unseen. To further obscure things, Michigan has its own Manitou Islands, two located west from Leland in Lake Michigan and one in Superior. When people hear "Manitoulin Island", they often confuse it with these Manitou Islands, not realizing that Manitoulin is a distinct (and much larger) island. In spite of growing up in Michigan, spending every summer "up north", and being an active boating enthusiast, it took thirty-five years before I even became aware of the existence of Manitoulin Island. 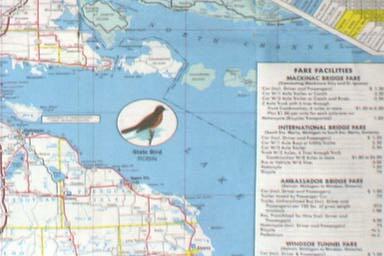 The vast majority of my fellow residents of the Great Lakes region probably still remain unaware. All islands seem to evoke feelings of mystery and timelessness. Their physical separation from the mainland often produces a cultural separation as well. Islands are always a little rustic and behind the times, it seems, from the mainlander's point of view. When travel to them is difficult, the feeling of separation increases. Manitoulin may only be located a few hundred miles due north of Detroit or Toronto, but reaching it --other than by boat-- has always been difficult. Manitoulin approaches the mainland of Ontario only at the island's extreme northeast corner, and, even then, it actually only makes contact with two other islands, reachable only at the end of a mountainous peninsula. To reach Manitoulin from Mackinaw City in Michigan's lower peninusla, you must cross the Straits of Mackinac, travel 50 miles across Michigan's upper peninsula, cross the international border at Sault Ste. Marie, bridge the St. Mary's River, traverse 200 miles of Ontario mainland forest, crest the La Cloche mountains, and wind your way down the rocky hills to the Little Current passage. When you consider that many of the bridges along this route were not built until the mid 1950's, you can see the historical difficulty in reaching the island from the south via automobile. When I first visited the island, in the summer of 1986, I was struck with a sense of magic all around. I could feel the presence of earlier sailors, warriors, and voyageurs, which I described in a journal of that trip. As I left Manitoulin that June aboard the Chi-Cheemaun ferry and watched the island disappear in the mists of Lake Huron, I was overwhelmed with a sense that there was magic in the place. I guess I felt the same things that Adam Kidd did back in 1830 when he wrote The Huron Chief. * MANITOULIN.-This name implies the residence of MANITOES, or genii, a distinction very commonly attributed to the Islands.-HENRY'S TRAVELS. The presence of its native people adds to the mystic and spiritual quality of Manitoulin. My understanding of their culture is limited, but I believe that for the Indians, Manitoulin was a sacred place. Today there is a large Indian population on the island, which was once entirely an Indian reserve. Town names like Wikwemikong and Sheguiandah convey a feeling of the older civilization and society that existed here. It is probably safe to say that 100 years ago more people lived and worked in the Manitoulin Island region than today. The remains of their old camps, their paper mills, and their logging industry are scattered all over the region. It's just when you have discovered some new little back bay --thinking it unknown or undiscovered by others-- that you find some artifact of the 1870's that lets you know that it was once a place on the map of commerce a century ago. When you mix these elements together --Island, Isolation, and Indians-- you get a powerful combination. From Crossways, Wm. B. Yeats, 1889. This article first appeared January 1995. Copyright © 1995, 1997, 1998, 1999 by James W. Hebert. All rights reserved.